This is my go-to party or holiday pleaser! This dessert can be made with ready made or homemade ingredients and is easy to prepare. Choose a large, attractive clear glass bowl or trifle bowl so that the layering can be seen. * If raspberries or strawberries are out of season, use other in-season fruit. Try bananas with kiwi, peaches and cherries, or whatever is available! ** If you are making homemade whipped cream, add very little sugar and a splash of cherry liqueur to give it a wonderful subtly-sweet flavor. *** If you prefer to make this without alcohol, omit the Kahlua and use Espresso coffee and European sipping chocolate mixed together to equal about 3 cups of liquid. You can find European Sipping Chocolate at Trader Joe’s. Cut chocolate cake into cubes. You will need enough cake to fill the bowl about 2/3 full without the other ingredients. Scatter 1/3 of the cubed cake into the bottom of the bowl and pour 1/3 of your Kahlua over the cake. Sprinkle the top with about 2 teaspoons of Espresso powder, or more if you want a stronger coffee flavor. 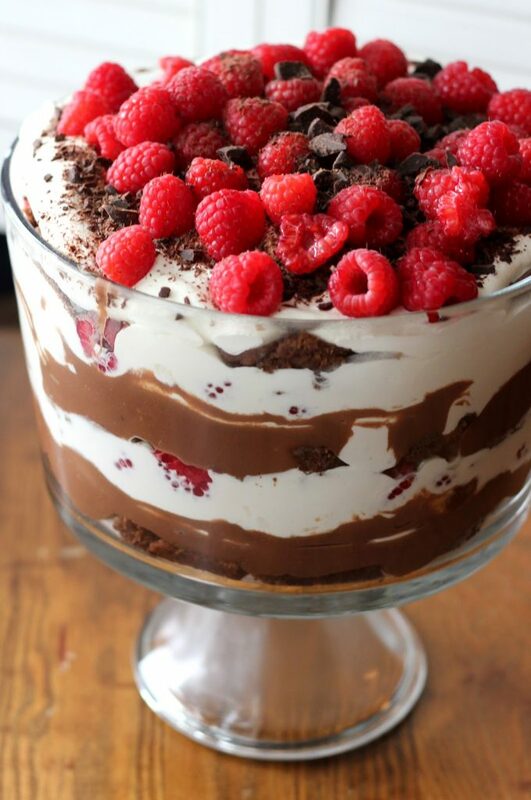 Place ½ of the raspberries or sliced strawberries over the cake and cover them with chocolate pudding, ½ of the total amount. Sprinkle the top of the pudding with 1/3 of the sliced almonds. Spoon 1/3 of the whipped cream over the almonds and smooth it out. Now you are ready to build the second layer. Again scatter 1/3 of the cake cubes, pour 1/3 Kahlua over the cake and sprinkle the cake with more Espresso powder. Place the remaining ½ of the berries on top, add the remaining half of the chocolate pudding, add 1/3 of the sliced almonds and 1/3 of the whipped cream. For the last layer, scatter on the remaining cake cubes, pour the remaining 1/3 Kahlua over the cake. Cover the top of the cake with the remaining whipped cream, sprinkle with a little Espresso powder and scatter with remaining almonds. Garnish with whole fresh raspberries, strawberries or chocolate covered strawberries. You can also add some shaved semi-sweet chocolate over the top!